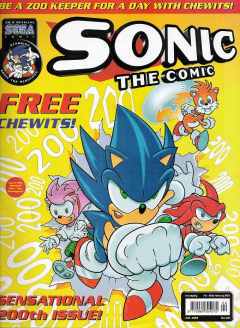 Sonic the Comic 200 is the two hundredth issue of the Sonic the Comic series by Fleetway Editions Ltd.
Speedlines: Sonic answers questions from readers regarding a new storyline, Sonic Underground, a potential new girlfriend for Sonic, Mighty the Armadillo's species, and the winners of a competition in issue #194. Graphic Zone: Fan art submitted by readers. The theme for this issue's Graphic Zone is "Winter Warmers", although the collection of pictures are purely a variety of scenes. Owners of the printed art won a Sonic the Hedgehog watch. This page was last edited on 18 March 2019, at 14:10.